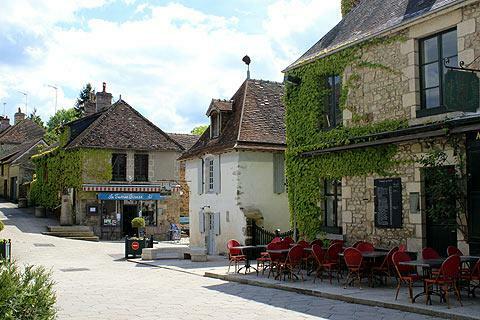 St-Ceneri-le-Gerei is a very pretty village in a lovely wooded setting on a bend in the River Sarthe in the heart of southern Normandy, in the Orne department to the south-west of Alencon, and officially classified as a 'most beautiful village of France'. The history of the village dates from the 7th century when an Italian called Ceneri decided to settle here, having witnessed a miracle, and soon attracted a group of disciples who constructed a monastery (the original monastery was destroyed by the vikings in the early 10th century). Start your visit on the little stone bridge that crosses the River Sarthe, and a look at the pretty houses along the river banks. 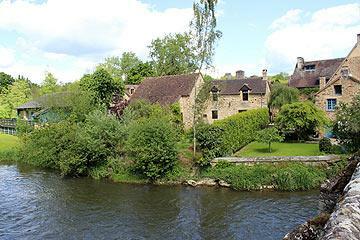 The village on both sides of the river is of interest, with picturesque cottages running up the hills from the bridge. 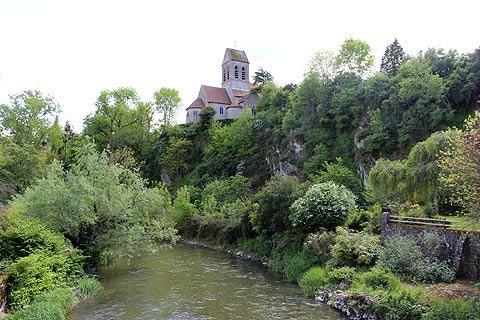 Saint-Ceneri is in the Parc naturel regional de Normandie-Marne and a tour of the villages in the park is a nice way of admiring the scenery. The Maison du Park on the edge of the river is the attractive building with lots of blue-painted wood and is home to various exhibitions. Heading up the hill into the historical centre of the village you will see the main town square and an 11th century church. 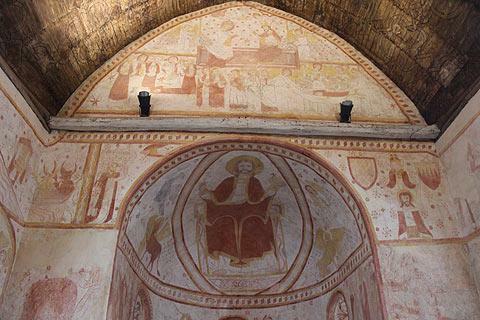 The church is in a simple roman style, the main decorative element being the arches in the clocktower, and contains some very high quality frescoes painted in the 12th and 14th century. In part, the frescoes are in such good condition because they were plastered over in the 17th century, only to be redicovered 200 years later. Further along the river there is small 15th century chapel on the site where Saint-Ceneri originally settled. The chapel contains a statue of Saint-Ceneri to which various miracles* have been attributed, both at the time that Saint-Ceneri first settled here and in the following centuries. Young ladies hoping to get married soon should bring a needle with them to the chapel to stick in the robe of the saint - if it stays in place you will be married within a year. Equally, ladies wanting to get pregnant should lie on the large stone in the chapel floor, which was the stone on which the saint slept, and can expect to fall pregnant shortly. 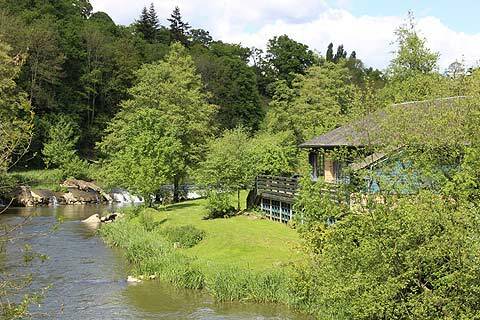 On the opposite banks of the river is an old water source which is attribued with the powers of healing eye problems. There is a path from the bridge to the 'miraculous source' that follows the other river bank. 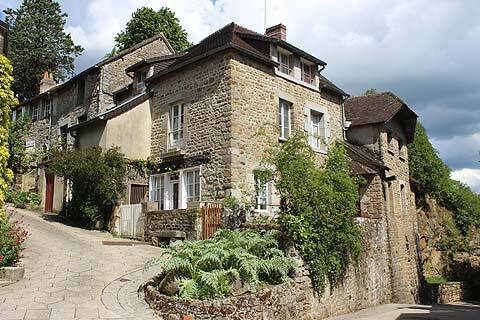 Nowadays Saint-Céneri-le-Gérei is better known for attracting artists than disciples, attracted of course by the unspoiled character of the village, and several artists have established galleries and workshops here. They are following a tradition that started in the middle of the 19th century when the village attracted many artists, poets and musicians. Take a look inside the Auberge Moisy and there is a room where lodging artists painted their profiles or those of other clients. A popular object for the paintings was the little chapel and an information board near the chapel shows some examples of the different styles of paintings of the chapel. The contrast between the colourful and serene paintings by Rene Veillon and Andre Paly and the bleak and rather sinister version by Bernard Buffet is quite striking. 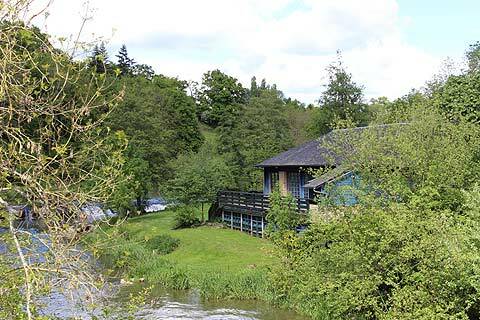 There is a large car park near to the river, a popular spot also for motor homes and this is a good spot for picnics. Canoeing along the Sarthe river through and near Saint-Ceneri-le-Gerie is a popular local activity. You can also walk to the summit of the Mont de Avaloirs - although only at an altitude of just over 400 metres, it is the highest point in the region and has far-reaching views. The village is also the starting point for a pretty 10 kilometre walk - pick up a leaflet from the tourist office. Nearby the Gardens at La Mansoniere are also recommended, with several different 'garden rooms' to be explored. 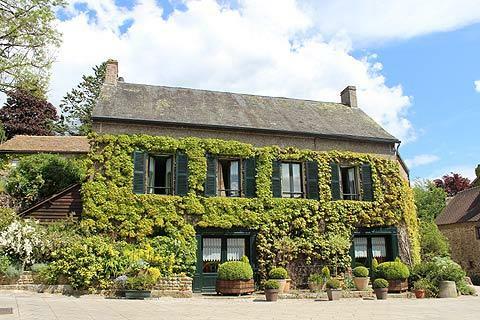 Most visitors are here to enjoy the countryside of the Regional Natural Park of Normandy-Maine - we suggest cycling and walking where possible - and towns of note nearby include Alencon and the riverside town of Fresnay-sur-Sarthe. 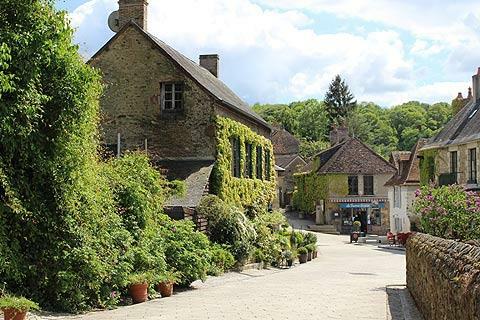 You can find more local travel ideas in the Orne guide and the Normandy guide.